System Mechanic safely repairs errors and fragmentation, cleans out clutter and tunes up your PC so it runs smoothly, reliably and faster. 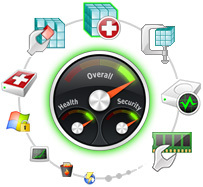 Dozens of tools work together to diagnose and automatically resolve virtually any problem. System Mechanic is radically different and much more effective than one-size-fits-all “utility” or “cleaner” type products on the market today. iolo Labs provides intelligent live updates, called Tune-up Definitions™, based on analysis of repair and optimization results from millions of PCs worldwide. Tune-up Definitions teach System Mechanic about the latest PC performance issues as they manifest and evolve in real time, keeping the product agile, safe, and powerful. It’s the brains behind its success, providing intelligence about the impact of specific settings, programs, and services unique to your PC. No matter what your experience level, System Mechanic is the #1 best-selling performance software, because it makes fixing and tuning up your own PC convenient and trouble-free with both fully automatic and self-directed options — plus it just works!